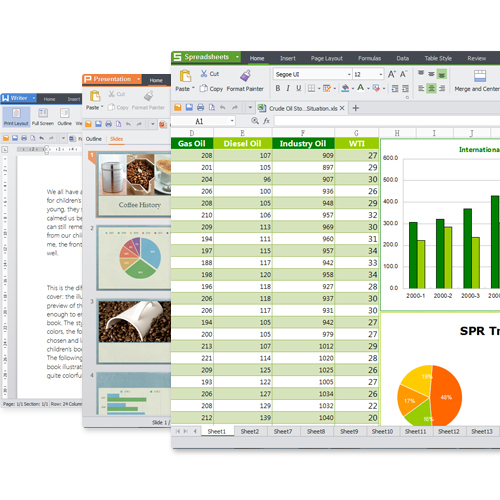 Kingsoft Office Suite Pro 2013, composed of Writer, Spreadsheets and Presentation, provides users with effective and productive office experience at a low price of only $69.95. Based on excellent features of Kingsoft Office Suite Free, pro version adds powerful functions such as VBA macros, intuitive paragraph tools and improved exporting. And it has no pop-up online templates homepage as in free version. In a word, pro version not only satisfies daily need for document processing, but also meets professional demand from enterprises. Powerful as it is, Kingsoft Office Suite Pro 2013 does not have a large installation package. With a package of mere 65.4MB, Kingsoft Office allows you to download and install at a lightning speed. Moreover, you donâ€™t need a powerful computer to run it, it takes up little RAM of your computer. There are more features for you to experience. Donâ€™t hesitate to try Kingsoft Office Professional 2013. Added: built-in spell check for US/UK English. Added: add multi-language dictionaries for spell check. WinM8 - Winm8 is a combined multi clipboard, launcher, Web bookmark and information management system. Winm8 is not just a multi clipboard - it is also a repository where you can store every piece of useful information you will ever need. Mgosoft PCL To PDF Command Line - Mgosoft PCL To PDF Converter is a fast, affordable way to batch convert your LaserJet PCL print files to industry standard PDF (Portable Document Format). Ace Clipboard History - Free Clipboard History Manager. The Ace Clipboard floats on top of your current work. Whenever you cut or copy, the clip appears in Ace. To paste back a clip, all you have to do is click on the one you want. DataNumen Word Repair - DataNumen Word Repair is a powerful Word recovery tool. It uses advanced technologies to scan the corrupt or damaged Microsoft Word documents (doc files) and recover your data in them as much as possible, so to minimize the loss in file corruption.